The United States Congress designated the Saint Lazaria Wilderness (map) in 1970 and it now has a total of 65 acres. All of this wilderness is located in Alaska and is managed by the Fish and Wildlife Service. Rising no more than 180 feet above the surging ocean at the entrance to Sitka Sound, Saint Lazaria Island was initially established as a refuge for seabirds, later became Wilderness, and has since been added as a subunit to the Alaska Maritime National Wildlife Refuge. 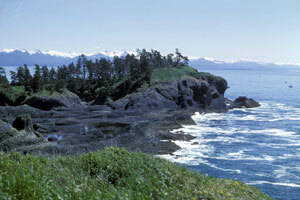 Saint Lazaria has two low summits, forested with mature Sitka spruce, which are connected by a bare saddle that is washed by waves at high tide. Cliffs topped with lush grasses fall to the sea. Among the tangled tree roots are the burrows of petrels, tufted puffins, and rhinoceros auklets. Pigeon guillemots create a nest-scrape in rocky crevices near common murres, glaucous-winged gulls, and pelagic cormorants. Just under half a million birds lay their eggs on Saint Lazaria, where overcast skies drizzle rain and winds blow moderately to strong throughout much of the year. People are asked to not land on the island, and especially not to walk around. Burrows are crushed easily (as are the occupants), and many birds may abandon their nest when disturbed, allowing the bolder gulls, crows, and ravens to swoop in and feed on eggs and chicks. Saint Lazaria receives 73.5 inches of precipitation, annually. Temperature reach their warmest in July and average between 51 F and 61 F. In January, temperatures average between 22 F and 32 F.
Planning to Visit the Saint Lazaria Wilderness? How to follow the seven standard Leave No Trace principles differs in different parts of the country (desert vs. Rocky Mountains). Click on any of the principles listed below to learn more about how they apply in the Saint Lazaria Wilderness.